Decorah will once again play host for a Robotics competition, this time Saturday, Dec. 15, in the Decorah Middle School gymnasium. Robotics teams from South Winneshiek, Aplington-Parkersburg, Mason City, Starmont, Wapsie Valley, Jesup, and the two Decorah teams will compete. In their 8th year, Robotics Club members participate in a program called FIRST Tech Challenge. At the beginning of the year, teams comprised of 7th– 12th grade students from around the world are given an obstacle course scenario. Teams then design, build, and program an 18 x 18 x 18 inch robot that they can control in order to score as many points possible within that scenario. This year’s Robotics competition is called Rover Ruckus, based on the 50th anniversary of the landing on the moon. The playing field this season includes two fake moon craters, moon “minerals,” and a moon lander. 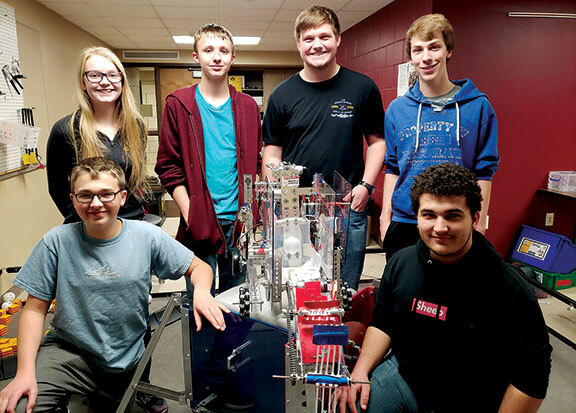 The Decorah Robotics club members participating in the competition include the junior/senior team of Bryan Anderson, Hayden Carlson, Henry Castro, Isaac Fish, Zach Harper, Thomas Hendrickson, Isaac Roberts, Megan Robinson, Kaj Spencer Berg, and Will Schwarz. The freshmen/sophomore team is comprised of Maxwell Devore, Ben Flack, Thomas Foster, Kolten Gossman, Jacob Leibold, and Matthew Smith. The community is invited to support the local Robotics team by joining them at the DMS gymnasium Dec 15, with matches running from approximately 10:30 a.m. to 12:30 p.m.